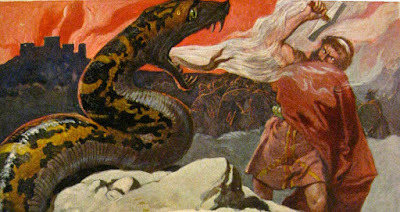 The Norse mythology books listed below are free to read online or download as eBooks. Some editions are out of print or were published before 1923 (and therefore in the public domain). Others have been posted online by academic institutions, authors, publishers or scholarly societies. The age of some of these works means that they feature dated translations and scholarship. This collection is not meant to replace study of the most recent work in the field of Norse mythology and religion, but to provide a resource for students and those without access to academic libraries. If you hold the copyright to one of these books and would like to remove it from this list, please contact The Norse Mythology Blog via this link. Carolingian Chronicles: "Royal Frankish Annals" and Nithard's Histories"
Illustrations of Northern Antiquities edited by Henry Weber et al. Includes "The Cult of Óðinn in Iceland," "Thurstable," and "Dreams in Icelandic Tradition"
The Viking Age in the Isle of Man edited by Christine Fell et al. Includes articles by Mindy MacLeod, Bernard Mees, Rudolf Simek, Diana Whaley, etc. Old Norse Religion in Long-Term Perspectives (excerpt) edited by Anders Andrén et al. edited by Helen F. Leslie et al. Thor’s hammer in Norway: A Symbol of Reaction Against the Christian Cross?